Sir Winston Leonard Spencer-Churchill KG OM CH TD FRS PC (Can) (30 November 1874 – 24 January 1965) was an English statesman and author, best known as Prime Minister of the United Kingdom during the Second World War. Well-known as an orator, strategist, and politician, Churchill was one of the most important leaders in modern British and world history. He won the 1953 Nobel Prize in Literature for his many books on English and world history. Sir Winston Churchill was voted the greatest-ever Briton in the 2002 BBC poll the 100 Greatest Britons. Churchill's legal surname was Spencer-Churchill (he was related to the Spencer family), but starting with his father, Lord Randolph Churchill, his branch of the family used the name Churchill in their public life. Winston Churchill was a descendant of the first famous member of the Churchill family, John Churchill, 1st Duke of Marlborough. Winston's politician father, Lord Randolph Churchill, was the third son of the 7th Duke of Marlborough; Winston's mother was Lady Randolph Churchill (née Jennie Jerome), daughter of American millionaire Leonard Jerome. Winston Churchill was born in Blenheim Palace in Woodstock, Oxfordshire on 30th November 1874. As was typical for upper-class boys at that time, he spent much of his childhood at boarding schools. At Harrow School, he had an independent and rebellious nature and generally did poorly, for which he was punished. However, he did well in English and history. He was also the school's fencing champion. He was rarely visited by his mother (then known as Lady Randolph), whom he loved very dearly, and wrote letters begging her to either come or let his father permit him to come home. As an adult, Winston developed a closer, sibling-like relationship with his mother. He followed his father's career keenly but had a distant relationship with him. His desolate, lonely childhood stayed with him throughout his life. On the other hand, as a child he was very close to his nanny, Elizabeth Anne Everest. After three attempts, Churchill was finally accepted at and attended the Royal Military Academy Sandhurst. Upon his graduation at age 20, Churchill joined the army as a Subaltern of the IV (Queen's Own) Hussars Cavalry regiment. He dislocated and injured his shoulder while disembarking upon his arrival in India for his first posting, an injury that would cause him problems in later years. In India, the main preoccupation of Churchill's regiment was polo, a situation which did not appeal to the young man, hungry for more military action. He devoted his time to educating himself from books which he had sent out to him. In 1895, he traveled to Cuba to observe the Spanish battles against Cuban guerrillas. Churchill obtained a commission to write about the conflict from the Daily Graphic newspaper. To Churchill's delight[citation needed], he came under fire for the first time on his twenty-first birthday. In 1897, Churchill attempted to travel to the Greco-Turkish War, but this conflict effectively ended before he could arrive. He went on to England on leave before rushing back to India to help put down the Pathan revolt on the North West Frontier. During the campaign, he wrote articles for the newspapers The Pioneer and The Daily Telegraph. By October 1897, Churchill was back in Britain and his first book, The Story of the Malakand Field Force, on that campaign, was published in December. While in India, Churchill used his family connections to get himself assigned to the army being put together and commanded by Lord Kitchener and intended to achieve the reconquest of the Sudan. While in the Sudan, Churchill participated in what has been described as the last meaningful British cavalry charge at the battle of Omdurman. He also served as a war correspondent for the Morning Post. By October 1898, he had returned to Britain and begun work on the two-volume The River War, published the following year. In 1899, Churchill left the army and decided upon a parliamentary career. He stood as a Conservative candidate in Oldham in a by-election of that year. He came in third (Oldham was at that time a two-seat borough), failing to be elected. On 12 October 1899, the war between Britain and the Afrikaners broke out in South Africa. Churchill went to South Africa as a war correspondent to cover second Anglo-Boer war in 1899. Caught in an ambush while riding a train, Churchill helped clear the track and get the train moving again with the wounded. Churchill himself, however, was captured and held in a POW camp in Pretoria. Churchill would later claim that he had been captured by General Louis Botha, subsequently prime minister of the then Union of South Africa, but this claim has been challenged, notably by Churchill's grand-daughter Celia Sandys in her book Churchill Wanted Dead or Alive. Churchill escaped from his prison camp and travelled almost 300 miles (480 km) to Portuguese Lourenço Marques in Delagoa Bay, with the assistance of an English mine manager. His escape made him a minor national hero for a time in Britain, though instead of returning home, he rejoined General Redvers Buller's army on its march to relieve Ladysmith and take Pretoria. This time, although continuing as a war correspondent, Churchill gained a commission in the South African Light Horse Regiment. He was one of the first British troops into Ladysmith and Pretoria; in fact, he and the Duke of Marlborough, his cousin, were able to get ahead of the rest of the troops in Pretoria, where they demanded and received the surrender of 52 Boer guards of the prison camp there. Churchill's two books on the Boer war, London to Ladysmith via Pretoria and Ian Hamilton's March, were published in May and October 1900 respectively. After returning from South Africa, Churchill again stood as a Conservative party candidate in Oldham, this time in the 1900 general election, or Khaki election. He was duly elected, but rather than attending the opening of Parliament, he embarked on a speaking tour throughout Britain and the United States, by means of which he raised ten thousand pounds for himself. (Members of Parliament were unpaid in those days and Churchill was not rich by the standards of other MPs at that time.) While in the United States, one of his speeches was introduced by Mark Twain. He dined with Theodore Roosevelt, however, they did not talk to each other. In February 1901, Churchill arrived back in Britain to enter Parliament, and became associated with a group of Tory dissidents led by Lord Hugh Cecil and referred to as the Hughligans, a play on "Hooligans". During his first parliamentary session, Churchill provoked controversy by opposing the government's army estimates, arguing against extravagant military expenditure. By 1903, he was drawing away from Lord Hugh's views. He also opposed the Liberal Unionist leader Joseph Chamberlain, whose party was in coalition with the Conservatives. Chamberlain proposed extensive tariff reforms intended to protect the economic preeminence of Britain behind tariff barriers. This earned Churchill the detestation of his own supporters — indeed, Conservative backbenchers staged a walkout once while he was speaking. His own constituency effectively deselected him, although he continued to sit for Oldham until the next general election. In 1904, Churchill's dissatisfaction with the Conservatives and the appeal of the Liberals had grown so strong that, on returning from the Whitsun recess, he crossed the floor to sit as a member of the Liberal Party. As a Liberal, he continued to campaign for free trade. He won the seat of Manchester North West (carefully selected for him) in the 1906 general election. When the Liberals took office, with Henry Campbell-Bannerman as Prime Minister, in December 1905, Churchill became Under-Secretary of State for the Colonies. Serving under the Secretary of State for the Colonies, Victor Bruce, 9th Earl of Elgin, Churchill dealt with the adoption of constitutions for the defeated Boer republics of the Transvaal and Orange River Colony and with the issue of 'Chinese slavery' in South African mines. He also became a prominent spokesman on free trade. Churchill soon became the most prominent member of the Government outside the Cabinet, and when Campbell-Bannerman was succeeded by Herbert Henry Asquith in 1908, it came as little surprise when Churchill was promoted to the Cabinet as President of the Board of Trade. Under the law at the time, a newly appointed Cabinet Minister was obliged to seek re-election at a by-election. Churchill lost his Manchester seat to the Conservative William Joynson-Hicks but was soon elected in another by-election at Dundee constituency. As President of the Board of Trade, he pursued radical social reforms in conjunction with David Lloyd George, the new Chancellor of the Exchequer. In 1910, Churchill was promoted to Home Secretary, where he was to prove somewhat controversial. A famous photograph from the time shows the impetuous Churchill taking personal charge of the January 1911 Sidney Street Siege, peering around a corner to view a gun battle between cornered anarchists and Scots Guards. His role attracted much criticism. The building under siege caught fire. Churchill denied the fire brigade access, forcing the criminals to choose surrender or death. Arthur Balfour asked, "He [Churchill] and a photographer were both risking valuable lives. I understand what the photographer was doing but what was the Right Honourable gentleman doing?" 1910 also saw Churchill preventing the army being used to deal with a dispute at the Cambrian Colliery mine in Tonypandy. Initially, Churchill blocked the use of troops fearing a repeat of the 1887 'bloody Sunday' in Trafalgar Square. Nevertheless, troops were deployed to protect the mines and to avoid riots when thirteen strikers were tried for minor offences, an action that broke the tradition of not involving the military in civil affairs and led to lingering dislike for Churchill in Wales. In 1911, Churchill became First Lord of the Admiralty, a post he would hold into World War I. He gave impetus to reform efforts, including development of naval aviation, tanks, and the switch in fuel from coal to oil, a massive engineering task, also reliant on securing Mesopotamia's oil rights, bought circa 1907 through the secret service using the Royal Burmah Oil Company as a front company. The development of the battle tank was financed from naval research funds via the Landships Committee, and, although a decade later development of the battle tank would be seen as a stroke of genius, at the time it was seen as misappropriation of funds. The tank was deployed too early and in too few numbers, much to Churchill's annoyance. He wanted a fleet of tanks used to surprise the Germans under cover of smoke, and to open a large section of the trenches by crushing barbed wire and creating a breakthrough sector. In 1915, Churchill was one of the political and military engineers of the disastrous Gallipoli landings on the Dardanelles during World War I. Churchill took much of the blame for the fiasco, and, when Prime Minister Asquith formed an all-party coalition government, the Conservatives demanded Churchill's demotion as the price for entry. For several months Churchill served in the sinecure of Chancellor of the Duchy of Lancaster, before resigning from the government, feeling his energies were not being used. He rejoined the army, though remaining an MP, and served for several months on the Western Front commanding a battalion of the Royal Scots Fusiliers. During this period, his second in command was a young Archibald Sinclair who would later lead the Liberal Party. In December 1916, Asquith resigned as Prime Minister and was replaced by Lloyd George. The time was thought not yet right to risk the Conservatives' wrath by bringing Churchill back into government. However, in July 1917, Churchill was appointed Minister of Munitions. He was the main architect of the Ten Year Rule, but the major preoccupation of his tenure in the War Office was the Allied intervention in the Russian Civil War. Churchill was a staunch advocate of foreign intervention, declaring that Bolshevism must be "strangled in its cradle". He secured, from a divided and loosely organised Cabinet, intensification and prolongation of the British involvement beyond the wishes of any major group in Parliament or the nation — and in the face of the bitter hostility of Labour. In 1920, after the last British forces had been withdrawn, Churchill was instrumental in having arms sent to the Poles when they invaded Ukraine. He became Secretary of State for the Colonies in 1921 and was a signatory of the Anglo-Irish Treaty of 1921, which established the Irish Free State. Churchill always disliked Éamon de Valera, the Sinn Féin leader. Notably, Churchill saw that Germany may still have been a threat, and engineered the Irish Free State agreement to include three ports effectively owned by the British Navy, which would have extended the range of anti-submarine patrols into the Atlantic. This clever and insightful advantage was carelessly thrown away, one year before the second world war started by Neville Chamberlain. In 1920, as Secretary for War and Air, Churchill had responsibility for quelling the rebellion of Kurds and Arabs in British-occupied Iraq, which he achieved by authorising the use of poison gas. At the time he wrote, "I am strongly in favour of using poison gas against uncivilised tribes" - although Churchill's intention was 'to cause disablement of some kind but not death'. If it occurred, this is the first recorded use of poison gas against a civilian population. However, while there is evidence that British commanders requested supplies of poison gas, the evidence for its actual use is lacking. Since the British relied primarily on air power to attack the Iraqis, and since air delivery of gas was not perfected until the 1930s, many historians doubt that gas was actually employed. In October 1922, Churchill underwent an operation to remove his appendix. Upon his return, he learned that the government had fallen and a General Election was looming. The Liberal Party was now beset by internal division and Churchill's campaign was weak. Even the local Dundonian newspapers contained vitriolic rhetoric with regards to his political status in the city. At one meeting, he was only able to speak for 40 minutes when he was barracked by a section of the audience. He came only fourth in the poll and lost his seat at Dundee to prohibitionist, Edwin Scrymgeour, quipping later that he left Dundee "without an office, without a seat, without a party and without an appendix". Churchill stood for the Liberals again in the 1923 general election, losing in Leicester, but over the next few months he moved towards the Conservative Party in all but name. His first electoral contest as an Independent candidate, fought under the label of "Independent Anti-Socialist," was narrowly lost in a by-election in a London constituency -- his third electoral defeat in less than two years. However, he stood for election yet again several months later in the General Election of 1924, again as an Independent candidate, this time under the label of "Constitutionalist" although with Conservative backing, and was finally elected to represent Epping (a statue in his honour in Woodford Green was erected when Woodford Green was part of the Epping constituency). The following year, he formally rejoined the Conservative Party, commenting wryly that "Anyone can rat [change parties], but it takes a certain ingenuity to re-rat." He was appointed Chancellor of the Exchequer in 1924 under Stanley Baldwin and oversaw Britain's disastrous return to the Gold Standard, which resulted in deflation, unemployment, and the miners' strike that led to the General Strike of 1926. This decision prompted the economist John Maynard Keynes to write The Economic Consequences of Mr. Churchill, arguing that the return to the gold standard would lead to a world depression. Churchill later regarded this as one of the worst decisions of his life; he was not an economist and that he acted on the advice of the Governor of the Bank of England, Montagu Norman. During the General Strike of 1926, Churchill was reported to have suggested that machine guns be used on the striking miners. Churchill edited the Government's newspaper, the British Gazette, and, during the dispute, he argued that "either the country will break the General Strike, or the General Strike will break the country." Furthermore, he controversially claimed that the Fascism of Benito Mussolini had "rendered a service to the whole world," showing, as it had, "a way to combat subversive forces" — that is, he considered the regime to be a bulwark against the perceived threat of Communist revolution. At one point, Churchill went as far as to call Mussolini the "Roman genius ... the greatest lawgiver among men." The Conservative government was defeated in the 1929 General Election. In the next two years, Churchill became estranged from the Conservative leadership over the issues of protective tariffs and Indian Home Rule, which he bitterly opposed. He denigrated the father of the Indian independence movement, Mahatma Gandhi, as "a half-naked fakir" who "ought to be laid, bound hand and foot, at the gates of Delhi and then trampled on by an enormous elephant with the new viceroy seated on its back". When Ramsay MacDonald formed the National Government in 1931, Churchill was not invited to join the Cabinet. He was now at the lowest point in his career, in a period known as "the wilderness years". He spent much of the next few years concentrating on his writing, including Marlborough: His Life and Times — a biography of his ancestor John Churchill, 1st Duke of Marlborough — and A History of the English Speaking Peoples (which was not published until well after World War II). He became most notable for his outspoken opposition towards the granting of independence to India (see Simon Commission and Government of India Act 1935). Soon, though, his attention was drawn to the rise of Adolf Hitler and the dangers of Germany's rearmament. For a time, he was a lone voice calling on Britain to strengthen itself to counter the belligerence of Germany. Churchill was a fierce critic of Neville Chamberlain's appeasement of Hitler, leading the wing of the Conservative Party that opposed the Munich Agreement which Chamberlain famously declared to mean "peace in our time". He was also an outspoken supporter of King Edward VIII during the Abdication Crisis, leading to some speculation that he might be appointed Prime Minister if the King refused to take Baldwin's advice and consequently the government resigned. However, this did not happen, and Churchill found himself politically isolated and bruised for some time after this. Yousuf Karsh portrait of Winston Churchill on cover of Life magazine. At the outbreak of the Second World War Churchill--after a brief offer by Chamberlain to appoint him as a minister without portfolio--was appointed First Lord of the Admiralty and a member of the War Cabinet, just as he was in the first part of the First World War. The Navy immediately sent out the signal: "Winston is back!" In this job, he proved to be one of the highest-profile ministers during the so-called "Phony War", when the only noticeable action was at sea. Churchill advocated the pre-emptive occupation of the neutral Norwegian iron-ore port of Narvik and the iron mines in Kiruna, Sweden, early in the War. However, Chamberlain and the rest of the War Cabinet disagreed, and the operation was delayed until the German invasion of Norway, which was successful despite British efforts. On 10 May 1940, hours before the German invasion of France by a surprising lightning advance through the Low Countries, it became clear that, following failure in Norway and general incompetence, the country had no confidence in Chamberlain's prosecution of the war and so Chamberlain resigned. The commonly accepted version of events states that Lord Halifax turned down the post of Prime Minister because he believed he could not govern effectively as a member of the House of Lords instead of the House of Commons. Although traditionally, the Prime Minister does not advise the King on the former's successor, Chamberlain wanted someone who would command the support of all three major parties in the House of Commons. A meeting with the other two party leaders led to the recommendation of Churchill, and, as a constitutional monarch, George VI asked Churchill to be Prime Minister and to form an all-party government. Churchill, breaking with tradition, did not send Chamberlain a message expressing regret over his resignation. Churchill's greatest achievement was that he refused to capitulate when defeat by Germany was a strong possibility and he remained a strong opponent of any negotiations with Germany. Few others in the Cabinet had this degree of resolve. By adopting this policy, Churchill maintained Britain as a base from which the Allies could attack Germany, thereby ensuring that the Soviet sphere of influence did not also extend over Western Europe at the end of the war. In response to previous criticisms that there had been no clear single minister in charge of the prosecution of the war, Churchill created and took the additional position of Minister of Defence. He immediately put his friend and confidant, the industrialist and newspaper baron Lord Beaverbrook, in charge of aircraft production. It was Beaverbrook's astounding business acumen that allowed Britain to quickly gear up aircraft production and engineering that eventually made the difference in the war. "This is not the end. It is not even the beginning of the end. But it is, perhaps, the end of the beginning"
His good relationship with Franklin D. Roosevelt secured vital food, oil and munitions via the North Atlantic shipping routes. It was for this reason that Churchill was relieved when Roosevelt was re-elected in 1940. Upon re-election, Roosevelt immediately set about implementing a new method of not only providing military hardware to Britain without the need for monetary payment, but also of providing, free of financial charge, much of the shipping that transported the supplies. Put simply, Roosevelt persuaded Congress that repayment for this immensely costly service would take the form of defending the USA; and so Lend-lease was born. Churchill had 12 strategic conferences with Roosevelt which covered the Atlantic Charter, Europe first strategy, the Declaration by the United Nations and other war policies. Churchill initiated the Special Operations Executive (SOE) under Hugh Dalton's Ministry of Economic Warfare, which established, conducted and fostered covert, subversive and partisan operations in occupied territories with notable success; and also the Commandos which established the pattern for most of the world's current Special Forces. The Russians referred to him as the "British Bulldog". Churchill's health suffered, as shown by a mild heart attack he suffered in December 1941 at the White House and also in December 1943 when he contracted pneumonia. Churchill was party to treaties that would redraw post-World War II European and Asian boundaries. These were discussed as early as 1943. Proposals for European boundaries and settlements were officially agreed to by Harry S. Truman, Churchill, and Stalin at Potsdam. At the second Quebec Conference in 1944 he drafted and together with U.S. President Franklin D. Roosevelt signed a toned down version of the original Morgenthau Plan, where they pledged to convert Germany after its unconditional surrender "into a country primarily agricultural and pastoral in its character." The settlement concerning the borders of Poland, that is, the boundary between Poland and the Soviet Union and between Germany and Poland, was viewed as a betrayal in Poland during the post-war years, as it was established against the views of the Polish government in exile. Churchill was convinced that the only way to alleviate tensions between the two populations was the transfer of people, to match the national borders. As he expounded in the House of Commons in 1944, "Expulsion is the method which, insofar as we have been able to see, will be the most satisfactory and lasting. There will be no mixture of populations to cause endless trouble... A clean sweep will be made. I am not alarmed by these transferences, which are more possible in modern conditions." However the resulting expulsions of Germans was carried out by the Soviet Union in a way which resulted in much hardship and, according to amongst others a 1966 report by the West German Ministry of Refugees and Displaced Persons, the death of over 2,100,000. Churchill opposed the effective annexation of Poland by the Soviet Union and wrote bitterly about it in his books, but he was unable to prevent it at the conferences. On 9 October 1944, he and Eden were in Moscow, and that night they met Joseph Stalin in the Kremlin, without the Americans. Bargaining went on throughout the night. Churchill wrote on a scrap of paper that Stalin had a 90 percent "interest" in Romania, Britain a 90 percent "interest" in Greece, both Russia and Britain a 50 percent interest in Yugoslavia. When they got to Italy, Stalin ceded that country to Churchill. The crucial questions arose when the Ministers of Foreign Affairs discussed "percentages" in Eastern Europe. Molotov's proposals were that Russia should have a 75 percent interest in Hungary, 75 percent in Bulgaria, and 60 percent in Yugoslavia. This was Stalin's price for ceding Italy and Greece. Eden tried to haggle: Hungary 75/25, Bulgaria 80/20, but Yugoslavia 50/50. After lengthy bargaining they settled on an 80/20 division of interest between Russia and Britain in Bulgaria and Hungary, and a 50/50 division in Yugoslavia. U.S. Ambassador Harriman was informed only after the bargain was struck. This gentleman's agreement was sealed with a handshake. Although the importance of Churchill's role in World War II was undeniable, he had many enemies in his own country. His expressed contempt for a number of popular ideas, in particular public health care and better education for the majority of the population, produced much dissatisfaction amongst the population, particularly those who had fought in the war. [citation needed] Immediately following the close of the war in Europe, Churchill was heavily defeated in the 1945 election by Clement Attlee and the Labour Party. Some historians think that many British voters believed that the man who had led the nation so well in war was not the best man to lead it in peace. Others see the election result as a reaction not against Churchill personally, but against the Conservative Party's record in the 1930s under Baldwin and Chamberlain. Unless some effective world supergovernment for the purpose of preventing war can be set up… the prospects for peace and human progress are dark… If… it is found possible to build a world organization of irresistible force and inviolable authority for the purpose of securing peace, there are no limits to the blessings which all men enjoy and share. From Stettin in the Baltic to Trieste in the Adriatic, an Iron Curtain has descended across the continent. Behind that line lie all the capitals of the ancient states of Central and Eastern Europe. Warsaw, Berlin, Prague, Vienna, Budapest, Belgrade, Bucharest and Sofia, all these famous cities and the populations around them lie in what I must call the Soviet sphere. Churchill was restless and bored as leader of the Conservative opposition in the immediate post-war years. After Labour's defeat in the General Election of 1951, Churchill again became Prime Minister. His third government — after the wartime national government and the brief caretaker government of 1945 — would last until his resignation in 1955. During this period, he renewed what he called the "special relationship" between Britain and the United States, and engaged himself in the formation of the post-war order. His domestic priorities were, however, overshadowed by a series of foreign policy crises, which were partly the result of the continued decline of British military and imperial prestige and power. Being a strong proponent of Britain as an international power, Churchill would often meet such moments with direct action. In 1951, grievances against the colonial distribution of land came to a head with the Kenya Africa Union demanding greater representation and land reform. When these demands were rejected, more radical elements came forward, launching the Mau Mau rebellion in 1952. On 17 August 1952, a state of emergency was declared, and British troops were flown to Kenya to deal with the rebellion. As both sides increased the ferocity of their attacks, the country moved to full-scale civil war. In 1953, the Lari massacre, perpetrated by Mau-Mau insurgents against Kikuyu loyal to the British, changed the political complexion of the rebellion and gave the public-relations advantage to the British. Churchill's strategy was to use a military stick combined with implementing many of the concessions that Attlee's government had blocked in 1951. He ordered an increased military presence and appointed General Sir George Erskine, who would implement Operation Anvil in 1954 that broke the back of the rebellion in the city of Nairobi. Operation Hammer, in turn, was designed to root out rebels in the countryside. Churchill ordered peace talks opened, but these collapsed shortly after his leaving office. In Malaya, a rebellion against British rule had been in progress since 1948. Once again, Churchill's government inherited a crisis, and once again Churchill chose to use direct military action against those in rebellion while attempting to build an alliance with those who were not. He stepped up the implementation of a "hearts and minds" campaign and approved the creation of fortified villages, a tactic that would become a recurring part of Western military strategy in Southeast Asia. (See Vietnam War). The Malayan Emergency was a more direct case of a guerrilla movement, centred in an ethnic group, but backed by the Soviet Union. As such, Britain's policy of direct confrontation and military victory had a great deal more support than in Iran or in Kenya. At the highpoint of the conflict, over 35,500 British troops were stationed in Malaya. As the rebellion lost ground, it began to lose favour with the local population. While the rebellion was slowly being defeated, it was equally clear that colonial rule from Britain was no longer plausible. In 1953, plans were drawn up for independence for Singapore and the other crown colonies in the region. The first elections were held in 1955, just days before Churchill's own resignation, and in 1957, under Prime Minister Anthony Eden, Malaya became independent. A young Winston Churchill and fiancée Clementine Hozier shortly before their marriage in 1908. On 12 September 1908 at the socially desirable St. Margaret's, Westminster, Churchill married Clementine Hozier, a woman whom he met at a dinner party that March (he had proposed to actress Ethel Barrymore but was turned down). They had five children: Diana; Randolph; Sarah, who co-starred with Fred Astaire in Royal Wedding; Marigold (1918 - 1921), who died in early childhood; and Mary, who has written a book about her parents. Churchill's son Randolph and his grandsons Nicholas Soames and Winston all followed him into Parliament. The daughters tended to marry politicians and support their careers. Clementine's mother was Lady Blanche Henrietta Ogilvy, second wife of Sir Henry Montague Hozier and a daughter of the 7th Earl of Airlie. Clementine's paternity, however, is open to debate. Lady Blanche was well known for sharing her favours and was eventually divorced as a result. She maintained that Clementine's father was Capt. William George "Bay" Middleton, a noted horseman. But Clementine's biographer Joan Hardwick has surmised, due to Sir Henry Hozier's reputed sterility, that all Lady Blanche's "Hozier" children were actually fathered by her sister's husband, Algernon Bertram Freeman-Mitford, better known as a grandfather of the infamous Mitford sisters of the 1920s. When not in London on government business, Churchill usually lived at his beloved Chartwell House in Kent, two miles south of Westerham. He and his wife bought the house in 1922 and lived there until his death in 1965. During his Chartwell stays, he enjoyed writing as well as painting, bricklaying, and admiring the estate's famous black swans. As a painter he was prolfic, with over 570 paintings and two sculptures, he revieved a Diploma from the Royal Academy, London. His paintings were catalouged after his death by historian David Coombs with the support of the Churchill family. Coombs has published two books on the subject. The modern archive of churchills art work is managed by designer, Tony Malone who oversees the administration and management of digital catalogue. Anthea morton saner and the churchill heritage trust are responsible for all copyrights. Like many politicians of his age, Churchill was also a member of several English gentlemen's clubs - the Reform Club and the National Liberal Club whilst he was a Liberal MP, and later the Athenaeum, Boodle's, Bucks, and the Carlton Club when he was a Conservative. Despite his multiple memberships, Churchill was not a habitual clubman; he spent relatively little time in each of these, and preferred to conduct any lunchtime or dinner meetings at the Savoy Grill or the Ritz, or else in the Members' Dining Room of the House of Commons when meeting other MPs. Churchill's fondness for alcoholic beverages was well-documented. While in India and South Africa, he got in the habit of adding small amounts of whisky to the water he drank in order to prevent disease. He was quoted on the subject as saying that "by dint of careful application I learned to like it." He consumed alcoholic drinks on a near-daily basis for long periods in his life, and frequently imbibed before, after, and during mealtimes. He is not generally considered by historians to have been an alcoholic, however, since his drinking produced few, if any, noticeable negative effects on either his ability to govern or his personal life. The Churchill Centre states that Churchill made a bet with a man with the last name of Rothermere (possibly one of the Viscounts Rothermere) in 1936 that Churchill would be able to successfully abstain from drinking hard liquor for a year; Churchill apparently won the bet. According to William Manchester in The Last Lion, Churchill's favorite whisky was Johnnie Walker Red. For much of his life, Churchill battled with depression (or perhaps a sub-type of manic-depression), which he called his black dog . Aware that he was slowing down both physically and mentally, Churchill retired as Prime Minister in 1955 and was succeeded by Anthony Eden, who had long been his ambitious protégé. (Three years earlier, Eden had married Churchill's niece, Anne Clarissa Spencer-Churchill, his second marriage.) Churchill spent most of his retirement at Chartwell House in Kent, two miles south of Westerham. In 1963, U.S. President John F. Kennedy acting under authorization granted by an Act of Congress, proclaimed Churchill the first Honorary Citizen of the United States. Churchill was too ill to attend the White House ceremony, so his son and grandson accepted the award for him. On 15 January 1965, Churchill suffered another stroke — a severe cerebral thrombosis — that left him gravely ill. He died nine days later, aged 90, on 24 January 1965, 70 years to the day after his father's death. By decree of the Queen, his body lay in State in Westminster Hall for three days and a state funeral service was held at St Paul's Cathedral. This was the first state funeral for a non-royal family member since 1914, and no other of its kind has been held since. As his coffin passed down the Thames on the Havengore, the cranes of London's docklands bowed in salute. The Royal Artillery fired a 19-gun salute (as head of government), and the RAF staged a fly-by of sixteen English Electric Lightning fighters. The state funeral was the largest gathering of dignitaries in Britain as representatives from over 100 countries attended, including French President Charles de Gaulle, Canadian Prime Minister Lester Pearson, Prime Minister of Rhodesia Ian Smith, other heads of state and government, and members of royalty. It also saw the largest assemblage of statesmen in the world until the funeral of Pope John Paul II in 2005. At Churchill's request, he was buried in the family plot at St Martin Church, Bladon, near Woodstock, not far from his birthplace at Blenheim. Because the funeral took place on 30 January, people in the United States marked it by paying tribute to his friendship with Franklin D. Roosevelt because it was the anniversary of FDR's birth. The tributes were led by Roosevelt's children. On 9 February 1965, Churchill's estate was probated at 304,044 pounds sterling (equivalent to about £3.8m in 2004). One of four specially made sets of false teeth, designed to retain Churchill's distinctive style of speech, which Churchill wore throughout his life is now kept in the Hunterian Museum at the Royal College of Surgeons of England. From 1941 to his death, he was the Lord Warden of the Cinque Ports, a ceremonial office. In 1941 Canadian Prime Minister William Lyon Mackenzie King swore him into the Queen's Privy Council for Canada. Although this allowed him to use the honorific title "The Honourable" and the post-nominal letters "P.C." both of these were trumped by his membership in the Imperial Privy Council which allowed him the use of The Right Honourable. In 1953, he was awarded two major honours: he was invested as a Knight of the Garter (becoming Sir Winston Churchill, KG) and he was awarded the Nobel Prize for Literature "for his mastery of historical and biographical description as well as for brilliant oratory in defending exalted human values". A stroke in June of that year led to him being paralysed down his left side. He retired as Prime Minister on 5 April 1955 because of his health, but retained his post as Chancellor of the University of Bristol, and remained a member of parliament until 1964. In 1959, he became Father of the House, the MP with the longest continuous service. In 1955, after retiring as Prime Minister, Churchill was offered elevation to the peerage in the rank of duke. He considered the offer, and even chose the name "Duke of London". However, he then declined the title after being persuaded by his son Randolph not to accept it, since Randolph wished to pursue a political career in the House of Commons, which would be impossible if he inherited a peerage, since, at that time, there was no procedure for disclaiming a title. Since then, only British royals have been made dukes. In 1956, Churchill received the Karlspreis (known in English as the Charlemagne Award), an award by the German city of Aachen to those who most contribute to the European idea and European peace. In 1960, Churchill College, Cambridge was established as the national and Commonwealth memorial to Churchill. In 1963, he became the first person to become an Honorary Citizen of the United States. 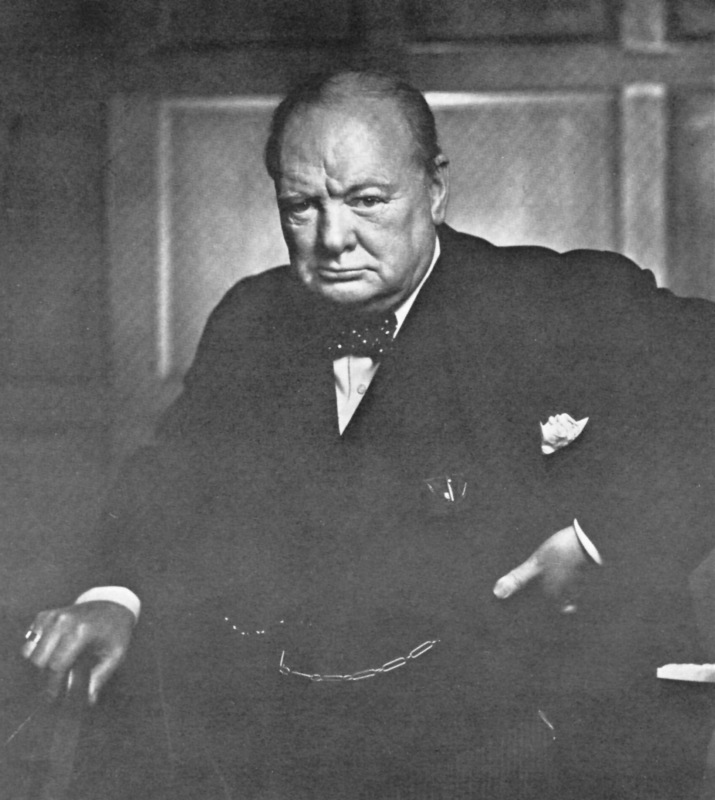 Churchill is the tenth most admired person by Americans in the 20th century, according to Gallup. Eight schools in Canada are named in his honour, one each in Vancouver, Winnipeg, Hamilton, Kingston, St. Catharines, Lethbridge, Calgary, and Ottawa. Churchill Auditorium at the Technion is named after him. "All great things are simple, and many can be expressed in single words: freedom, justice, honour, duty, mercy, hope. Winston Churchill — Prime Minister, Minister of Defence and Leader of the House of Commons. Clement Attlee — Lord Privy Seal and effective Deputy Leader of the House of Commons. October 1940: Sir John Anderson succeeds Neville Chamberlain as Lord President. Sir Kingsley Wood, the Chancellor of the Exchequer, and Ernest Bevin, the Minister of Labour, enter the War Cabinet. Lord Halifax assumes the additional job of Leader of the House of Lords. December 1940: Anthony Eden succeeds Lord Halifax as Foreign Secretary. Halifax remains nominally in the Cabinet as Ambassador to the United States. His successor as Leader of the House of Lords is not in the War Cabinet. May 1941: Lord Beaverbrook ceased to be Minister of Aircraft Production, but remains in the Cabinet as Minister of State. His successor was not in the War Cabinet. June 1941: Lord Beaverbrook becomes Minister of Supply, remaining in the War Cabinet. 1941: Oliver Lyttelton enters the Cabinet as Minister Resident in the Middle East. 4 February 1942: Lord Beaverbrook becomes Minister of War Production, his successor as Minister of Supply is not in the War Cabinet. 19 February 1942: Beaverbrook resigns and no replacement Minister of War Production is appointed for the moment. Clement Attlee becomes Secretary of State for Dominion Affairs and Deputy Prime Minister. Sir Stafford Cripps succeeds Attlee as Lord Privy Seal and takes over the position of Leader of the House of Commons from Churchill. Sir Kingsley Wood leaves the War Cabinet, though remaining Chancellor of the Exchequer. 22 February 1942: Arthur Greenwood resigns from the War Cabinet. March 1942: Oliver Lyttelton fills the vacant position of Minister of Production ("War" was dropped from the title). Richard Gardiner Casey (a member of the Australian Parliament) succeeds Oliver Lyttelton as Minister Resident in the Middle East. October 1942: Sir Stafford Cripps retires as Lord Privy Seal and Leader of the House of Commons and leaves the War Cabinet. His successor as Lord Privy Seal is not in the Cabinet, Anthony Eden takes the additional position of Leader of the House of Commons. The Home Secretary, Herbert Morrison, enters the Cabinet. September 1943: Sir John Anderson succeeds Sir Kingsley Wood (deceased) as Chancellor of the Exchequer, remaining in the War Cabinet. Clement Attlee succeeds Anderson as Lord President, remaining also Deputy Prime Minister. Attlee's successor as Dominions Secretary is not in the Cabinet. November 1943: Lord Woolton enters the Cabinet as Minister of Reconstruction. January to November 1944: Lord Moyne replaces Richard Gardiner Casey as Minister Resident in the Middle East. March 1952: Lord Salisbury succeeds Lord Ismay as Commonwealth Relations Secretary. Salisbury remains also Lord Privy Seal and Leader of the House of Lords. Lord Alexander of Tunis succeeds Churchill as Minister of Defence. May 1952: Harry Crookshank succeeds Lord Salisbury as Lord Privy Seal, remaining Leader of the House of Commons. Salisbury remains Commonwealth Relations Secretary and Leader of the House of Lords. Crookshank's successor as Minister of Health is not in the Cabinet. November 1952: Lord Woolton becomes Chancellor of the Duchy of Lancaster. Lord Salisbury succeeds Lord Woolton as Lord President. Lord Swinton succeeds Lord Salisbury as Commonwealth Relations Secretary. September 1953: Florence Horsbrugh, the Minister of Education, Sir Thomas Dugdale, the Minister of Agriculture, and Gwilym Lloyd George, the Minister of Food, enter the cabinet. The Ministry for the Co-ordination of Transport, Fuel, and Power, is abolished, and Lord Leathers leaves the Cabinet. October 1953: Lord Cherwell resigns as Paymaster General. His successor is not in the Cabinet. July 1954: Alan Lennox-Boyd succeeds Oliver Lyttelton as Colonial Secretary. Derick Heathcoat Amory succeeds Sir Thomas Dugdale as Minister of Agriculture. October 1954: Sir David Maxwell-Fyfe, now Lord Kilmuir, succeeds Lord Simonds as Lord Chancellor. Gwilym Lloyd George succeeds him as Home Secretary. The Food Ministry is merged into the Ministry of Agriculture. Sir David Eccles succeeds Florence Horsbrugh as Minister of Education. Harold Macmillan succeeds Lord Alexander of Tunis as Minister of Defence. Duncan Sandys succeeds Macmillan as Minister of Housing and Local Government. Osbert Peake, the Minister of Pensions and National Insurance, enters the Cabinet. ^ Simons, Geoff (1994). Iraq : from Sumer to Saddam. London: St. Martins Press, 179-181. ISBN 0312102097. ^ Churchill Howled Down (HTML). Churchill the Evidence (1922). Retrieved on November 14, 1922. ^ Hall, Douglas J (1950). All the Elections Churchill Ever Contested (HTML). Churchill and...Politics. The Churchill Centre. ^ Picknett, Lynn, Prince, Clive, Prior, Stephen & Brydon, Robert (2002). War of the Windsors: A Century of Unconstitutional Monarchy, p. 78. Mainstream Publishing. ISBN 1-84018-631-3. ^ Picknett, et al., p. 75. ^ Picknett, et al., pp. 149–150. ^ Picknett, et al., pp. 156–158. ^ Picknett, et al., p. 190. ^ Picknett, et al., p. 252. Michael R. Beschloss, (2002) The Conquerors: Roosevelt, Truman and the Destruction of Hitler's Germany, 1941-1945 pg. 131. Martin Gilbert Churchill: A Life (1992) (ISBN 0-8050-2396-8); one volume version of 8-volume life (8900 pp); amazing detail but as Rasor complains, "no background, no context, no comment, no analysis, no judgments, no evaluation, and no insights." James, Robert Rhodes. Churchill: A Study in Failure, 1900-1939 (1970), 400 pp. François Kersaudy, Churchill and De Gaulle 1981 ISBN 0-00-216328-4. Christian Krockow, Churchill: Man of the Century by 2000 ISBN 1-902809-43-2. John Lukacs. Churchill : Visionary, Statesman, Historian Yale University Press, 2002. Rasor, Eugene L. Winston S. Churchill, 1874-1965: A Comprehensive Historiography and Annotated Bibliography. Greenwood Press. 2000. 710 pp. describes several thousand books and scholarly articles. Gilbert, Martin, ed. Winston S. Churchill: Companion 15 vol (14,000 pages) of Churchill and other official and unofficial documents. Part 1: I. Youth, 1874-1900, 1966, 654 pp. (2 vol); II. Young Statesman, 1901-1914, 1967, 796 pp. (3 vol); III. The Challenge of War, 1914-1916, 1971, 1024 pp. (3 vol); IV. The Stricken World, 1916-1922, 1975, 984 pp. (2 vol); Part 2: The Prophet of Truth, 1923-1939, 1977, 1195 pp. (3 vol); II. Finest Hour, 1939-1941, 1983, 1328 pp. (2 vol entitled The Churchill War Papers); III. Road to Victory, 1941-1945, 1986, 1437 pp. (not published, 4 volumes are anticipated); IV. Never Despair, 1945-1965, 1988, 1438 pp. (not published, 3 volumes anticipated, See the editor's memoir, Martin Gilbert, In Search of Churchill: A Historian's Journey, (1994). James, Robert Rhodes, ed. Winston S. Churchill: His Complete Speeches, 1897-1963. 8 vols. London: Chelsea, 1974, 8917 pp. Quotations database, World Beyond Borders.